SUV ramp suggestions for getting in! Sure! You’ve come to the right place. I know you’re looking for a side-ramp, but many dogs are averse to using them because they naturally have poor depth perception, and ramps are scary. You may want to test ShuShu on a ramp before buying one, just in case she freaks out. 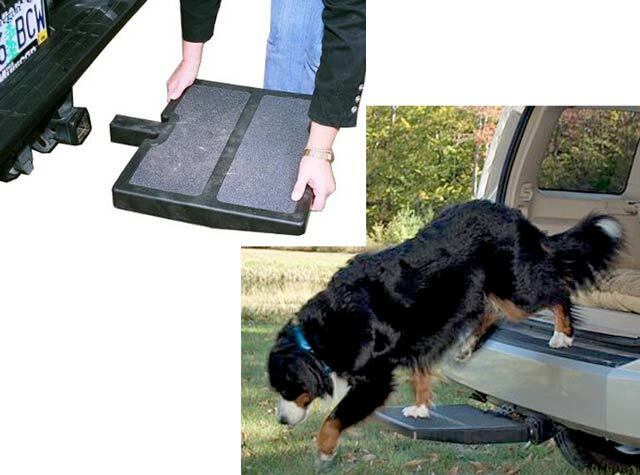 If you’re set on one you can try these dog ramp training tricks. Also, something that’s really cool is a hitch-step like the OttoStep. I am also looking for help getting my boy IN my Explorer! Getting him out is easy. He won’t ride in the rear of the car, it freaks him out. So I put his crate (it has a wide side that folds up into the top of the crate so he doesn’t feel locked in) in my second row and leave the front open so he’s forced to sit down (out of the crate, he will refuse to sit down during any car ride), but won’t freak out at being locked in the crate. It’s working great for our daily trips to my grandmas house, but getting him IN the SUV is a challenge when I’m dressed and ready for work and don’t want dog hair all over my shirt! How big is Riot? He is a rear amp, right? My little Pug mix Elly is missing a back leg- I get her in and out of my truck with a RuffWear WebMaster harness, she never leaves the house without it on. Elly is only about 15.5 pounds, she thinks she is climbing in the truck on her own! Add Reply: SUV ramp suggestions for getting in!